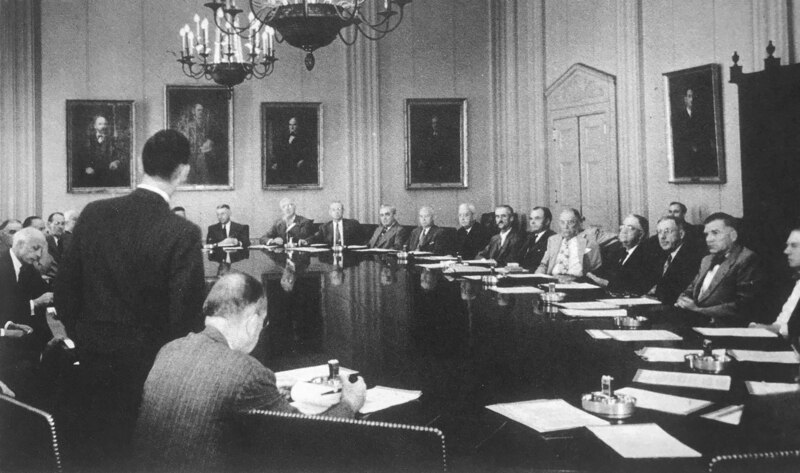 Seated at an enormous board table are more than two dozen men in white shirts, ties and business suits. The top executives of the industrial giant are identified as “men with backgrounds in various phases of business.” The year is 1952. Nearly 60 years would pass before a woman would head that DuPont Co. table. The company’s glass ceiling was broken in 2009 when Ellen Kullman became the first woman CEO and board chairman at the-then 207-year-old company. Kullman — who retired as DuPont’s CEO and chair in 2015 — has been on a mission to speed up the glacial progress of women executives to the C-suite. In 2016, she co-founded Paradigm for Parity, a coalition of business leaders pushing to have women in 50% of senior leadership positions by 2030. Joining Kullman as co-chairs are Jewelle Bickford, a partner with Evercore Wealth Management, and Sandra Beach Lin, former CEO of Calisolar Inc.
For companies that seek to take steps in 2018 to eliminate gender disparity in their boardrooms, as well as their top offices, Kullman’s coalition, and other such initiatives, could serve as a useful partner by providing concrete actions companies can take. After all, the C-suite often leads to the boardroom, Kullman points out. And the push to get gender diversity in the boardroom will be even stronger this year with large investors ramping up the pressure. “There is compelling evidence that boards with a critical mass of women have outperformed those that are less diverse. Diverse boards also more effectively demonstrate governance best practices that we believe lead to long-term shareholder value,” wrote F. William McNabb III, chairman of the board of Vanguard in a letter to directors of public companies. But increasing the numbers in the boardroom and the corner office will take serious work. 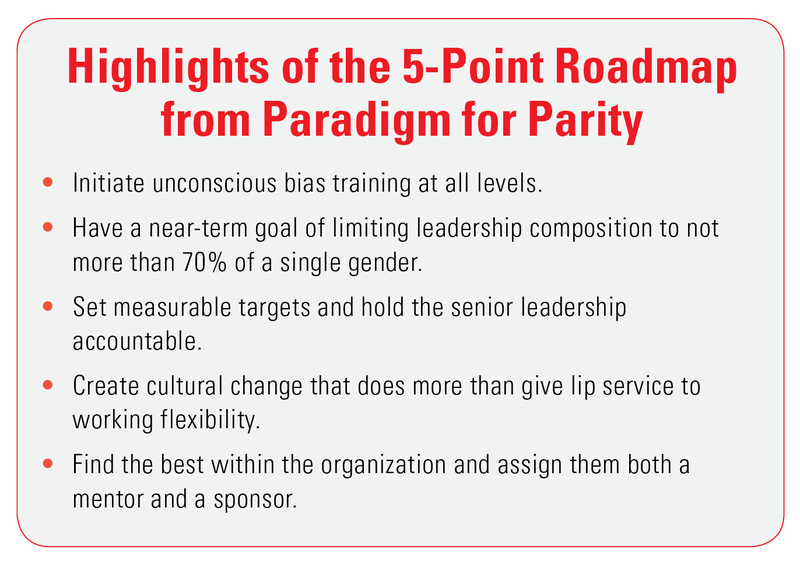 Paradigm for Parity’s goal for top leadership is ambitious considering that women held just 26.5% of executive and senior level positions at S&P 500 companies in 2017, according to Catalyst, whose mission is to expand opportunities for women. But Kullman is optimistic. In the year since Paradigm was launched, 60 companies have committed to gender equality in their halls of power. The organization grew out of discussions among a group of women executives who lamented that their daughters were facing the same kinds of issues they faced, Kullman says. Women enter the workforce at an equal rate as men, but their numbers dwindle up the corporate ladder. Last year, women represented 11% of top earners at S&P 500 companies, according to Catalyst. Only 5.2% of CEOs at these companies are women. “If we as senior leaders weren’t going to do anything about it, who would?” Kullman says. For these women, the key was getting senior leadership to sign and commit to an action plan. After months of volunteer work, the group developed a five-point roadmap to help companies achieve gender parity across all leadership levels. The plan’s practical steps include initiating unconscious bias training, setting measurable goals and working with investors to measure and monitor diversity progress. Companies that have committed to the coalition’s goals include AstraZeneca, Bank of America, Coca-Cola Co., Wal-Mart Stores Inc. and United Technologies, to name a few. Ellyn Shook, chief leadership and human resources officer at Accenture, explained that her company got on board because of the “extraordinary respect” for the three Paradigm co-founders and the fact the coalition couples commitment with an action plan. The initiative comes as a harsh spotlight has been trained on the treatment of women in the workplace. Gender inequality issues — from compensation imbalances to sexual harassment — grabbed headlines in recent months, and with them has come a demand for change. “I think we are at a tipping point,” says Charlotte Laurent-Ottomane, executive director of the Thirty Percent Coalition, an organization working to have corporate boardrooms reflect the gender, racial and ethnic diversity of the U.S. workforce. What makes this moment unique is the merging of all the gender disparity issues into a call for real action, says Roberta Liebenberg, an attorney and co-founder of DirectWomen, whose mission is to promote qualified women attorneys for corporate boards. Environmental, Social & Governance: Key transparency and performance issues for 2018. Director Liability: Boards are on the hot seat over data breaches, illegal sales practices and more. Shareholder Engagement: BlackRock, CalSTRS, among other investors, upping pressure on boards. Board Size: Governance experts see smaller boards as more effective, but who’s listening? There’s also been upheaval in the corporate world with companies rocked by scandals surrounding misogynistic cultures. Some companies have experienced reputational and financial damage as a result. “Change happens with disruption,” explains Sukhinder Singh Cassidy, chairman of theBoardlist, which works to connect women in tech with board opportunities. Ernst & Young signed on with Paradigm at the beginning. There are performance benefits of having women in the C-suite, notes Karyn Twaronite, a partner and Global Diversity & Inclusiveness Leader at EY. Indeed, companies with a higher percentage of women in top management outperform their peers in a number of financial areas, according to Credit Suisse Research Institute. “It’s good for our business,” Twaronite explains. Still, she agrees that the tensions of recent months surrounding gender disparity issues have been a catalyst for change, sparking important dialogue. “People are engaging in really substantive conversations,” she says. Sponsorship is “absolutely crucial” to women’s progress, Kullman says. When it comes time for decisions to be made about “Who’s going to get that job,” men have natural sponsors in the room, she explains. Women need someone to speak for them. Looking ahead, the coalition will focus on the metrics surrounding the action plan in 2018. “You’ve got to measure where you are,” Kullman says.